Aside from F-2A, all family-based categories will move up at least one week. The largest gains are for Philippines F-1 (moving up 7 months to January 1, 2003) and Mexico F-2B (moving up 3.5 months to November 22, 1993). The other categories moved up 1-6 weeks. As mentioned, India EB-2 will move up all the way to September 1, 2008. 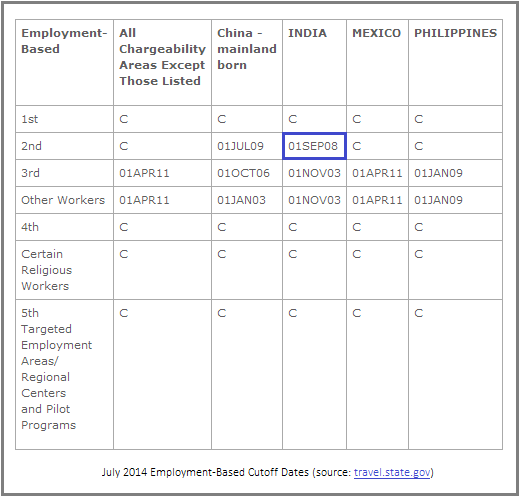 The only other categories to see any movement for July are China EB-2, India EB-3, and India Other Workers, all of which will move up 10-15 days. 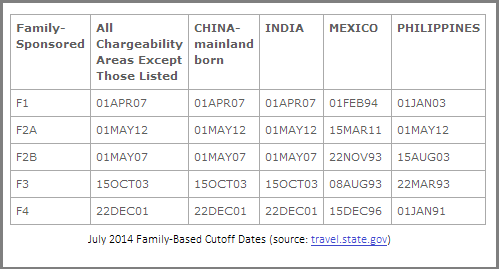 Unlike past months, the Department of State did not add a note about predicted future movement of cutoff dates.